Violet Jessop was born to Irish emigrants working a sheep farm in Argentina. After her father died, Violet and her family moved to the UK, where she attended a convent school. She took a job as a ship's stewardess and was aboard RMS Titanic when it struck an iceberg and sank on April 14, 1912. She was among the survivors who were rescued. 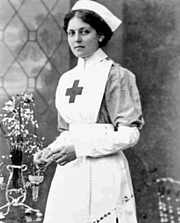 During World War I, she served as a stewardess for the British Red Cross. She was on the hospital ship Britannic when it sank in the Aegean Sea off the coast of Greece, and again survived. Violet Jessop is currently considered a "single author." If one or more works are by a distinct, homonymous authors, go ahead and split the author. Violet Jessop is composed of 2 names. You can examine and separate out names.